Cassidy may be tiny, but what he lacks in size, he more than makes up for in spirit. The courageous little kitten was saved from certain death earlier this month by the Canada-based rescue group, Tiny Kittens Society. When Cassidy was discovered in a feral cat colony in British Columbia, both his back legs were missing, possibly accidentally chewed off by his mother after birth. Despite his painful injuries, however, he persisted nine weeks until help finally arrived. "It is a medical miracle that he survived even a day with such severe injuries, let alone nine weeks," Cassidy's saviors wrote on Facebook. "His little body had just about given out from starvation and infection by the time we rescued him, but he never gave up!" Although Cassidy was now out of harm's way, the good folks at the Tiny Kittens Society knew that in order for him to lead a happy and fulfilling life, it was essential that he be able to get around on his own. So, they enlisted the help of engineers at Handicapped Pets Canada, a company that specializes in making mobility devices for pets with disabilities. Using a 3-D printer, they were able to create a special little wheelchair that perfectly fit Cassidy's pint-sized frame - allowing the amputee kitten to take his very first steps.Cassidy still has a long road ahead of him before he's adopted out into a forever home, but thanks to all the kind people helping him along the way - and his new set of wheels - we have no doubt he'll get there.To learn how you can help Cassidy and other cats like him, visit Tiny Kitten Society's website here. 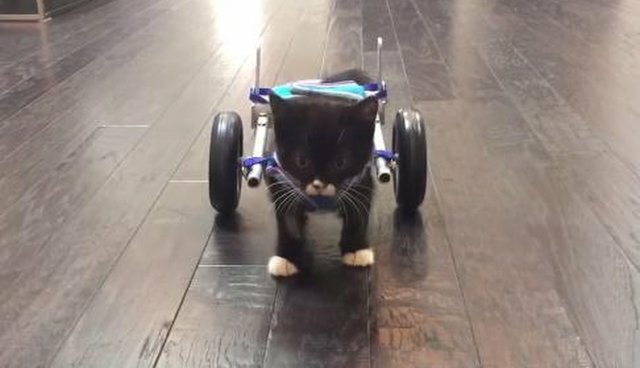 Using a 3-D printer, they were able to create a special little wheelchair that perfectly fit Cassidy's pint-sized frame - allowing the amputee kitten to take his very first steps. Cassidy still has a long road ahead of him before he's adopted out into a forever home, but thanks to all the kind people helping him along the way - and his new set of wheels - we have no doubt he'll get there. To learn how you can help Cassidy and other cats like him, visit Tiny Kitten Society's website here.